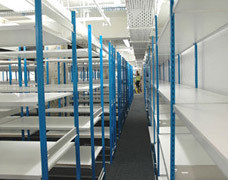 We provide a free design service to help you find the most suitable and cost effective storage solution for your needs. If you have an idea of what you're looking for we can discuss this with you over the telephone and then prepare a budget price based on a sketch of your plan. If however you are not sure about what you require then we would be happy to arrange a visit to your premises to discuss your needs in more detail. We will look at your storage requirement based on the size and number of items that need storing and the frequency of throughput to determine the most efficient and cost effective solution for you. We will work with you to understand fully how your business operates in order to make the right proposal, if you simply need to store 1,000 boxes then we will calculate the space required and the best type of shelving or racking to suit the size and weight of the items. If you requirement is more complex then there are many solutions that we can consider depending on the size, volume, rate of stock turn and what happens to the product between goods in and despatch. You are under no obligation to place an order with us and we'd encourage you get another couple of quotes. We've spent over 20 years solving our customers' storage problems and we're confident that we'll propose a plan that you're happy with at a competitive price. We will discuss with you a basic outline of your needs based on the approximate size and number of items you want to store and how you will access and move them. This can be anything from shoe boxes, hanging garments, bicycle parts and rug storage to school lockers and Really Useful Box shelving. This need not take very long, but it is the essential first step. We will then visit you and calculate the available space taking into account the dimensions, flooring, doors and windows and any obstructions such as light fittings as well as the size and weight of the items you want to store, to ensure there is no risk of overloading. We can offer space saving solutions such as mobile storage and mezzanine storage, creating high density options out of smaller spaces. Our drawings are created by our expert designer using the latest CAD software and these will be sent out to you for your approval. Using CAD means that if you want changes, large or small, we can incorporate these with the minimum trouble. You can also supply us with a floor plan if this is available and we can work from that. We provide racking inspection services to businesses throughout the UK, no matter what age, style or make of racking you have installed we can provide a full examination and report by our highly experienced inspectors who work to the SEMA code of practice. After a thorough analysis, any damage or potential problems will be reported along with detailed recommendations for rectifying all issues found. Do I Need A Racking Inspection? Under Health & Safety legislation, a racking inspection is required at least once every 12 months, more frequent inspections may be required dependent upon your warehouse traffic and use levels. It is your responsibility to ensure all racking is safe for employees to use, failure to do so may lead to prosecution in the event of an accident. What Are The Benefits Of Rack Inspections? Regular maintenance can help to reduce insurance premiums. Having a written record of all racking inspections will help to persuade safety officers that racking equipment was maintained correctly in the event of a workplace accident. 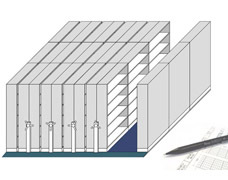 Reduces the chances of a costly racking collapse by identifying potential problems at an early stage. 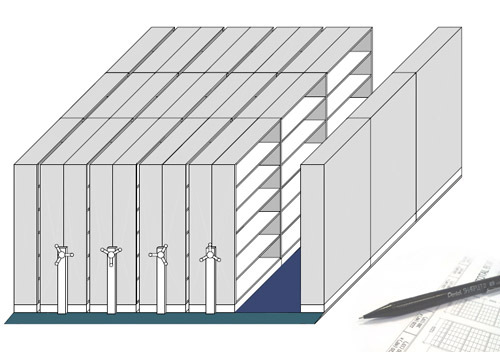 Helps to improve operating methods within the warehouse to reduce ongoing maintenance costs. A rack inspection for an average size warehouse will take approximately 5-6 hours on-site to complete, your full co-operation during this time will ensure the inspection is carried out efficiently with as little disruption to your warehouse as possible. Our inspectors are sympathetic to your business needs and can work around busy warehouse times/days if required. Carry out a risk assessment to ensure all racking can be investigated safely. List out all damages found in-line with the SEMA code of practice. Note the use of any manual handling equipment that may be affecting the results of the inspection. Check accident reporting and weekly checks are being carried out by the client, if not then advise the advantages of this to the client. Inspect load notices are present and suitable for the racking being used. Observe general warehouse operations, pallet types and condition then report any concerns. Highlight any hot spots where repetitive damage is occurring (based upon previous record keeping). Ensure the racks are being used correctly as per their original design. Ensure the client has signed a copy of the RED RISK damages document. Once complete the examination report will be sent to you detailing everything that the inspector has found, our reports are written in a clear and concise manner that allow clients to quickly see current and potential dangers and how best to act upon them. 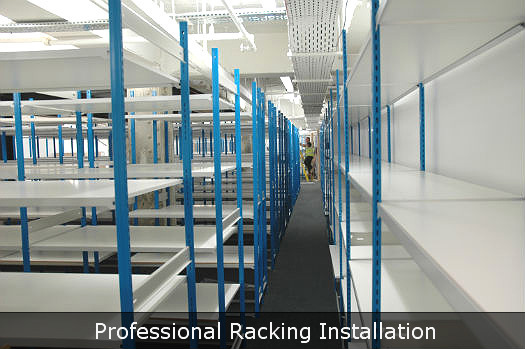 Call us on 01993 779494 for further information or to book one of our comprehensive racking inspections. 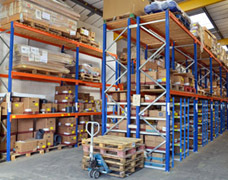 Our experienced racking installation teams are based nationwide and are available to install anything from a couple of bays of stockroom shelving to a warehouse full of pallet racking. We have teams of 2, 3 or more according to the size of the racking installation and they are fully trained to the latest industry standards and H&S requirements. You will find our teams polite and courteous and will keep you informed of progress at all times. We are happy to discuss variations during the installation as its not always possible to envisage the end result from a drawing and we'll do our best to implement any changes for minimum cost. 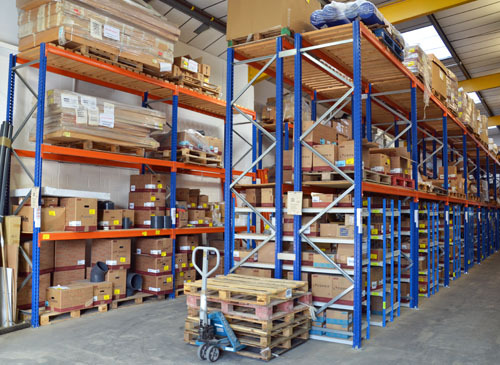 As well as warehouse shelving installations, we also install mobile shelving and roller racking units which need to be installed to a high degree of accuracy. We use the latest laser technology to ensure that everything aligns correctly and the tracks are levelled to the required tolerances. We ask that sites are clear and level and that light and power is provided; please help us to help you by preparing the area prior to our arrival on site, we will endeavour to carry out the work with the minimum disruption to you and your business.